Welcome to my "Strength and Comparison" article for the coming week. The article "Ranking, Rating and Score" has also been published. 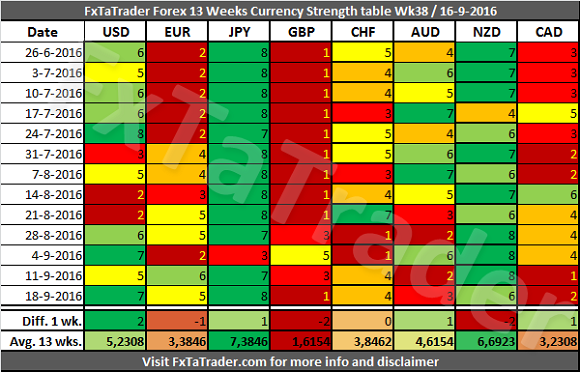 For analyzing the best pairs to trade looking from a longer term perspective the "13 weeks Currency Classification" can be used in support. In the last weeks the EUR gained a lot of strength. According to the Currency Strength table here above the Avg. 13 Weeks is higher than that of the CAD. The CAD scored 7 times higher than the EUR in the last 13 weeks. However, the CAD is close to becoming a weak currency also for the coming period if it remains this weak. 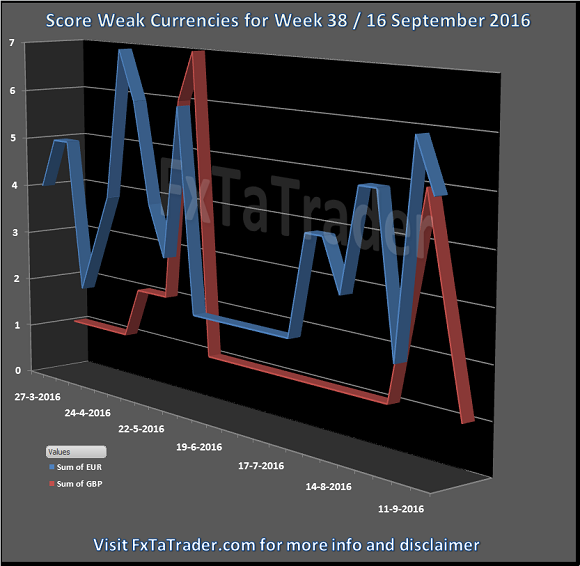 The GBP is clearly a weak currency and had in the last weeks 2 times a stronger period but is now back to the lowest score of 1. 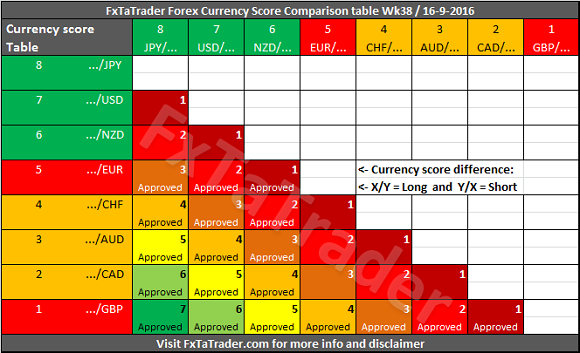 Even though they are in the same classification when looking at the 13 weeks average a currency may be in a weaker/stronger period and may even change its classification in the future. See the current classification for the coming period at the beginning of this article. Unless this currency offers a clear opportunity based on the longer term it seems best to be avoided. However, this currency may offer opportunities for the short term trader. GBP/JPY, GBP/USD, GBP/NZD, CAD/JPY, EUR/GBP, NZD/CAD, EUR/JPY and GBP/CHF. Top 10 pairs in the "Ranking and Rating List" all the currencies comply except for the EUR/JPY and GBP/CHF. Technical Analysis (TA) of the Daily and Weekly chart the pairs GBP/JPY, GBP/USD, NZD/CAD, GBP/NZD and CAD/JPY comply.